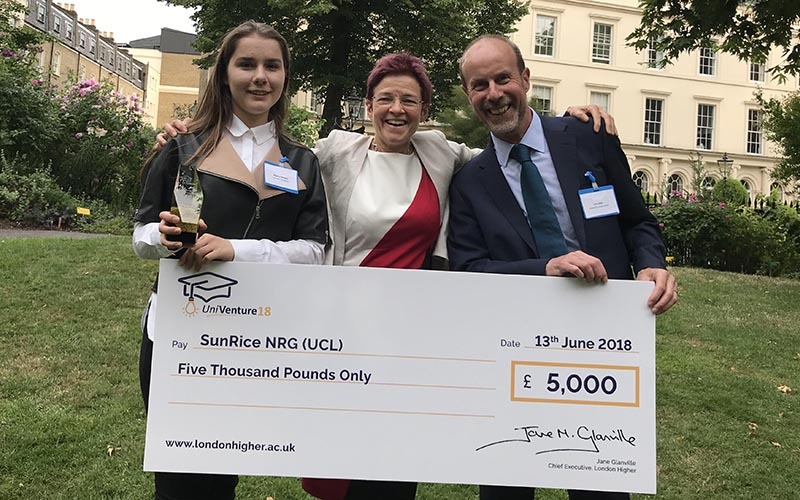 Rice Inc, a UCL Innovation & Enterprise supported social enterprise, has won the inaugural London Student Entrepreneur Competition. Their winning idea aims to reduce rice waste in South East Asia. It was the team’s ground-breaking rice drying business idea that won them the judge’s vote and the grand prize of £5,000. The award was presented at the London Higher Garden Party on Wednesday 13 June 2018. Founded by second year UCL undergraduate students Lincoln Lee, Kisum Chan, Julia Vannaxay and Claire Lim, Rice Inc hopes to solve one of the world's most pressing food problems. They aim to address the 350 million tons of rice lost post-harvest every year by offering farmers new drying technology at an affordable price - which will also help lift farmers out of poverty. Pitch consultant and member of the UniVentures judging panel, Andrew Tollinton, said: “One of the most challenging aspects of any pitch is communicating an idea in a clear and compelling way. Rice Inc achieved this. Rice Inc clearly meticulously prepared their pitch. This gave them freedom to express their enthusiasm for their solution. Entrepreneurial journeys require bucket-loads of enthusiasm. As part of the competition, 11 teams from 11 London universities pitched their idea to an expert panel, who scored their ideas based on set criteria. UniVenture is only open to early stage and ‘pre-revenue’ ideas, from all backgrounds. Participants can put forward any idea they wish. It’s an inclusive competition which is intended to epitomise the diversity of the London higher education sector and give those just starting out a boost. Rice Inc weren't able to accept their prize in person due to commitments in Myanmar, where they're piloting their solar-powered rice drying business with farmers. The accolade was accepted on behalf of Rice Inc by UCL student and Campus Director of the Hult Prize, Mascha Samkova. The team has already won first prize in the UK regional finals of the Hult Prize and will now compete against the top 50 international teams. If they’re selected as one of the top six during an eight-week summer accelerator programme, they'll win a place in the grand finals at the United Nations in New York this September. The UniVenture Competition is the brain child of the London Higher network, a collaboration of 37 London universities working together to promote entrepreneurship. Celia Caulcott Vice-Provost (Enterprise) spoke at the event on behalf of both UCL, UCL Innovation & Enterprise and the London Economic Action Partnership (LEAP).